Money Magazine's 101 Ways to Build Wealth offers valuable financial tips for each stage of your life. Listed below are their bits of advice for 25- to 34-year-olds. To read the full article for more details, click here. 1) Start saving for retirement now. 3) Add microcap stocks for growth. 6) Get smarter about your money. 7) Get with the program. 8) Watch what you buy. 9) Build your credit score. 10) Slash your student loans. How much can I contribute to my IRA this year? What is my income tax rate? What tax incentives are available for education expenses? How much money can I make without affecting my Social Security benefit? Find answers to these questions and many more by clicking here. Here's more advice on having a conversation with your aging parents about their money. 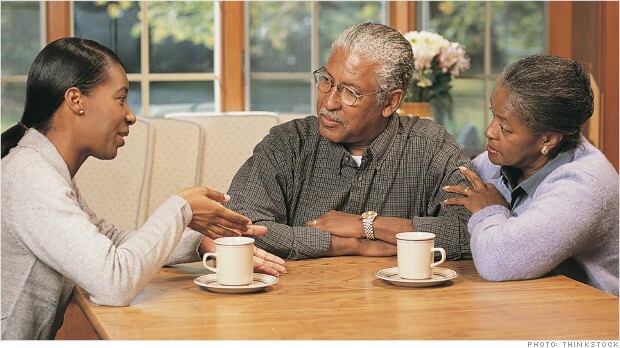 From CNN Money, Ismat Sarah Mangla's article, "How to Ask Your Aging Parents About Their Money," provides more strategies for presenting these duscussions in the best way to to avoid potential conflict. It's not too late to make IRA contributions for 2012, but please be aware that we must receive your deposit no later than April 15, 2013. Please note that in 2013, contribution limits increased to $5,500 (if under 50) and $6,500 (if 50+).